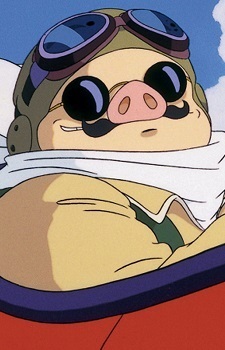 Born Marco Pagot, Porco was an ace fighter pilot for the Italian Air Force in World War I. A curse has since given him the appearance of a pig, leading to the nickname Porco Rosso (Italian for "Red Pig"). He now operates as a bounty hunter in the Adriatic Sea, fighting air pirates in his distinctive red sea plane. The crest on Porco Rosso's sea plane is the coat of arms of the city of Geneva. Geneva is his hometown and he is a republican.